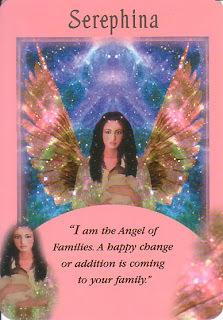 A combination of intuitive guidance and the card of the day from Angel Oracle decks. After morning prayer I ask the angels to please choose the card that resonates with all of us. The messages that we get from our angels can teach us so much if we only listen and pay attention. Card of the Day ~Serephina~ I am the Angel of families. A happy change or addition is coming to your family. This could mean you will be having a baby, your adoption for a baby has been approved, you are bringing in a pet which; will be your fur baby or it could mean that your prayers for help within the family has been answered. I understand that family isn’t always a bed of roses and we all have healing to do. The angels guide us to the most loving solutions when healing. I pray you all have an amazing day. I love you all!